Office Partition Wall Panels. Feco Ireland. If somebody is building or modernising today, he needs to plan his future space requirements. Flexibility is essential in professional areas like offices, administration, banks and data prosessing centres, schools, universities, institutes and hospitals. The feco® - partitition wall system provides flexibility for the future. Inserted full lenght clipsrail form a strong connection with the uprights, resulting therefore in a very stable construction. Proven by tests according to DIN 4103. 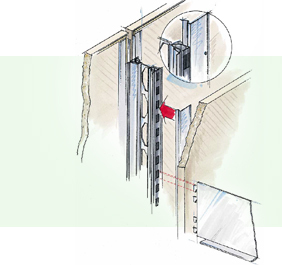 At the same time the partition wall panels are fixed in respect of lateral displacement. This ensures modular accuracy and especially an exact joint. Spacers are not nesessary. The constant accuracy of the connection between partition wall panels and substructure result in the best acoustic insulation ( standard already Rw.p=46 dB).